During the early years of Washington’s Administration, Secretary of the Treasury, Alexander Hamilton, strive diligently to establish a sound system of banking in an effort to stabilize the currency of the nation. However, due to failure of Continental Currency and the lack of immediate convertibility into the proposed federal US dollar, speculation and volatility plagued the financial markets. The Bank of the United States script became the focus of a flight to quality causing wild gyrations and insane volatility. The price swings from its original price of par 100, rose dramatically in a bidding war reaching 195 followed by a collapse back to 110 with a reaction rally to 145. Such wild price swings in this script issue caused numerous failures. Hamilton responded by authorizing the Cashier of the Bank of New York to purchase government bonds and stocks on behalf of the Treasury. 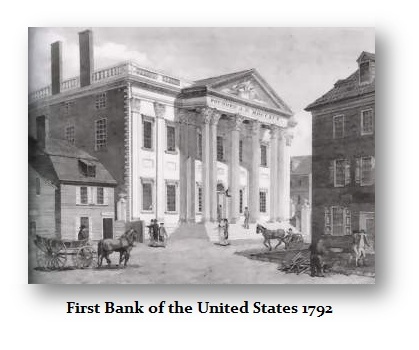 This constituted effort to inject capital into the system was intended to help relieve the merchants in New York City at that time and ensure that the credit of the newly founded United States would survive. The Panic of 1791 was the first major crisis in the post-Revolutionary War period of this nation.